Getting an MBA is an expensive choice-one almost impossible to justify regardless of the state of the economy. Even the elite schools offer outdated, assembly-line programs that teach more about PowerPoint presentations and unnecessary financial models than what it takes to run a real business. 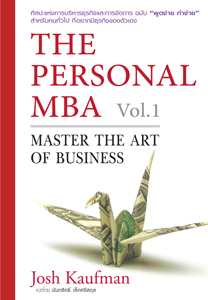 The Personal MBA explains essentials of entrepreneurship, marketing, sales, negotiation, operations, productivity, systems design, and much more, in one comprehensive volume. However, the Thai version is divided into two separate volumes.